Because the entire world is currently running IPv4, one of the big questions is how to move people over to IPv6. It is not like they can just announce that on January 1 the Internet will use only IPv6. That just would not work. 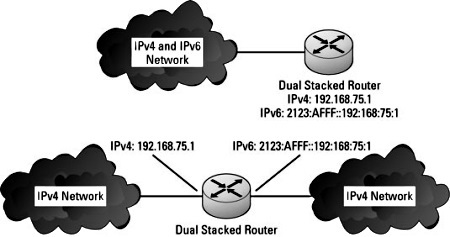 • Dual-stack: In dual-stack configuration, the device is configured for both IPv4 and IPv6 network stacks. The dual-stack configuration can be implemented on a single interface or with multiple interfaces. In this configuration, the device decides how to send the traffic based on the destination address of the other device. • Manual IPv6-to-IPv4 tunneling encapsulates an IPv6 packet in an IPv4 packet. So as to not fragment the packet from adding the IPv4 header to it, the data packet needs to be reduced by 20 bytes if the IPv4 has an optional protocol field, or 20 octets if it does not, as well as require routers support both IP stacks. • Dynamic 6-to-4 tunneling routes data between islands of IPv6 routers across your network. • Intra-Site Automatic Tunnel Addressing Protocol (ISATAP) tunneling uses the existing IPv4 network as the link layer of the IPv6 network and routes the data between the IP networks via routers supporting both IP stacks. • Teredo tunneling performs the tunneling work at the dual-stacked host on either end of the connection rather than at a gateway router. • Proxying and translation (NAT-PT): Network Address Translation-Protocol Translation (NAT-PT) places a translation mechanism on the network, which translates traffic going back and forth between IPv4 and IPv6. With these methods available to companies, ISPs, and users, the path to migrate your network to IPv6 does not need to be long or difficult. This is an excerpt from Cisco Networking All-in-One For Dummies.